Today I started my Assessment of Language Minority Students class. So far it feels like a good fit! My teacher is really chill and very intelligent. 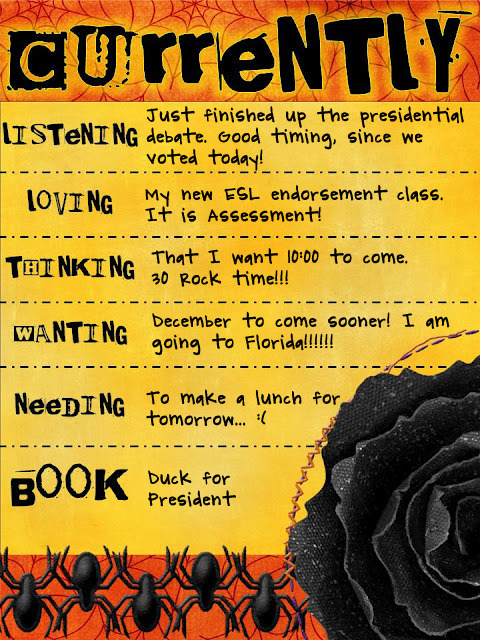 I think I will learn a lot and I am really excited about having the opportunity to effectively assess my ELLs!! Also it's my last class that I need to take to have my ESL endorsement. Yay for me! It is cold in Chicago in December. It is warm in Florida in December (or so I am told). I chose Duck for President as my favorite fall book because I also love elections. They are fun to teach about and the kids get really into it. I also love Grace for President. What great books! In the process of planning Election Day for our school. Will add Duck for President to the list. Visiting from Farley's. It's so funny that so many people are coming to Florida. Where are you visiting? I live in Florida, so I may be able to give you ideas of places to go.